Senator Sheldon Whitehouse (D-RI) went to the floor of the Senate on Monday, May 20, 2013 and made an absolute fool of himself. 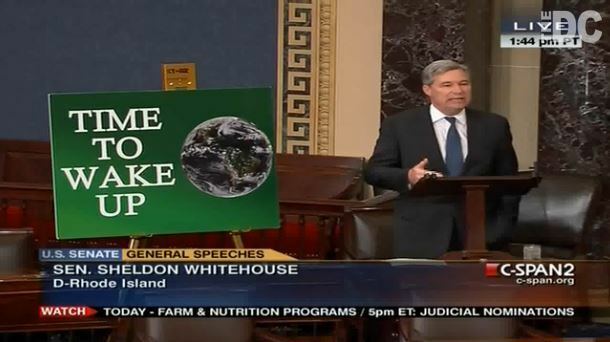 Shortly after the devastating and tragic tornado had struck Moore, OK, with its huge loss of life and property, Senator Whitehouse immediately went to the Senate floor to “blame” this event on Global Warming. What level of thoughtlessness and insensitivity would compel a United States Senator to rush to the floor of the Senate and make a bunch of politically motivated comments after such a tragic event? The answer is, a Democrat whose mind is so twisted with the far left politics of the extreme environmentalism that any tragedy is worth exploiting as long if it means convincing a few more fools that Global warming is responsible for the tragedy in Oklahoma. The sad fact is that Senator Whitehouse is wrong on a number of fronts. First, he is wrong to exploit a major American tragedy, with massive loss of life and properly, purely for partisan political purposes. Second, he is wrong to dishonor the Senate and its traditions, which call for leading political figures to express sorrow and invoke prayers for the dead and injured after such an event, and not to make some inane political speech. And third, he is completely wrong on his facts and on the science of climate change and its discredited cousin – Global Warming. It is ironic that one day before the Oklahoma tragedy and Senator Whitehouse’s rant on the Senate floor, the BBC published an article entitled Climate slowdown means extreme rates of warming 'not as likely'. In the article, the author Matt McGrath explains that since 1998, there has been an unexplained "standstill" in the heating of the Earth's atmosphere. The article goes on to point out that there are a whole range of uncertainties in the future for Climate Change, but a key finding is that there was little or no change in the Earth’s temperature over the last 15 years. What About Other Weather Related Disasters? Let’s look at hurricanes. According to the NOAA, the USA has recently had its longest stretch in recorded history without a major hurricane strike. From May 4, 2013 it has been 2750 days (7 years, 6 months, 11 days) since the last major Hurricane (Cat 3 or greater) hit the USA on October 24th 2005 when hurricane Wilma made landfall. Each new day is a new record in this major hurricane drought. OK, what about drought? Droughts are less frequent and less severe than in prior, colder centuries and the number of wildfires is in long-term decline. An article entitled Trends in 20th century drought over the continental United States discusses 20th Century trends in soil moisture increases in the USA. In a recent interview on FOX News, Meteorologist Joe Bastardi compared today’s weather patterns in the USA to the 1050’s, when we had similar, very bad tornadoes. This results from the warmer Pacific and a colder Atlantic and we can expect more bad storms this year. It has nothing to do with Global Warming (which is non-existent) or Climate Change. Besides the enormous costs of cleaning up and rebuilding resulting from this devastating tornado, the real cost may turn out to be the push for additional government programs, carbon related laws and massive government intrusion to “save the world from Global Warming”. This disaster is just what the Environmental lobby needed to spur the Federal Government into “acting” in the public interest. Senator Whitehouse’s stupid rant on the Senate floor on Monday was just the starting point. You can expect the liberal media, the tree huggers and the environmental wacko’s to start their campaign for more money, more laws, more carbon taxes and more intrusive laws and treaties from the United Nations to attempt to control every aspect of our lives. We are already inundated with Agenda 21 initiatives and more of this is likely to happen. Conservatives need to be wary of any legislative efforts aimed at solving non-problems like Global Warming. Conservatives need to educate themselves on this issue as it is a prime excuse for much more chicanery by the Obama administration. This tragedy in Oklahoma could not have come at a better time for Obama, as he can use this event to make Americans forget about all of the administrations illegal activities and cover-ups. Don’t let this happen!